Businesses across Australia are turning to this technology to automate and digitise cumbersome workflows and processes so that the owners and operators can focus their attention on growth and the future, instead of putting out fires around the office and in the field. In stark contrast, those who are opting out of the job management software trend are continuing to see inconsistencies in their cash flows, poor time management, and a loss of jobs and customers due to substandard performance as a result of inefficiencies behind the scenes. simPRO is a leading Australian provider of job management software and we want to make sure that businesses in the electrical sector are aware of the operational change they are missing out on by continuing to opt for manual processes instead of automated workflows. To do that, here's just 3 common workflow inefficiencies of the many that a job management solution can solve. Whether it's the job notes written on scraps, complete lack of job record or constant chasing up of staff; timesheets aren't everyone's cup of tea. 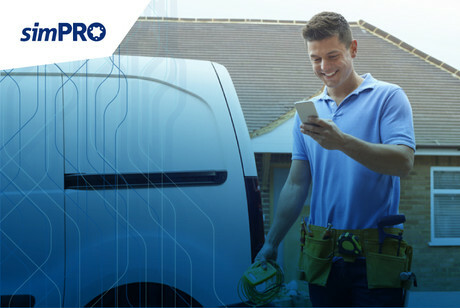 However, simPRO's mobile application has a Timesheet module to make even the most forgetful electrician a time management star. With it, users can autonomously edit time blocks with ease. They can update start and stop times, add attachments to jobs and quotes and view schedules far in advance, all from the tablet or smartphone they carry with them. Then, thanks to simPRO's cloud-based nature, the information they input is stored within the business' simPRO system, which staff can electronically access from any web browser — meaning quick and easy timesheet review for schedulers, accountants, operators, and more. By digitising the recording process and automating the transfer of timesheet data from one device to another, the management of fickle schedules is a dream to complete. No more 'guesstimates' of time spent on work, timesheet scribbles or late arrivals to jobs, more accountability and awareness for electricians. The concept of upselling creates a looming sense of dread in any electrician you come across. However, it's a valuable business process that is a great way to bring in extra revenue. So how do you encourage the upsell? Give your team the tools they need to do it with as little effort as possible. simPRO Mobile's Quote and Sales module has everything staff need to easily upsell and present a quote on a smartphone or tablet. Electricians can quickly create professional quotes, with multiple options, and even incorporate images, videos and manuals, all of which can easily be shown to the customer, with their device, while on site. Automating the quoting process, and introducing the digital element in the field, enables your team to operate quickly and effectively when it comes to the dreaded upsell. No calling back to the office, no unclear pricing, instead, electricians can confidently offer additional services or parts with the right information, and wow customers with unparalleled levels of professionalism and efficiency. So, in just 3 minutes you've read about two comprehensive and efficient approaches job management software takes when it comes to automating business workflows. It is not about removing the need for people in jobs, it is about making those jobs easier so that staff in the office and on the ground can work at optimal levels for positive cash flow, and business leaders can focus on their plans for the future. It is a time of prosperity for the electrical sector, but unless you have the means to extinguish common process and workflow fires in the office, you won't have the time to take advantage of these big market changes.